Every flu season, we look for ways at our clinic to help our patients fight the flu. It is important that our patients stay healthy throughout the entire year, including flu season. Staying healthy lowers the chances of patients having to visit the doctor or the hospital. Without insurance, these trips do not come cheap. Alliance takes steps to give our patients free resources to help avoid expensive trips to the doctor or drug store. 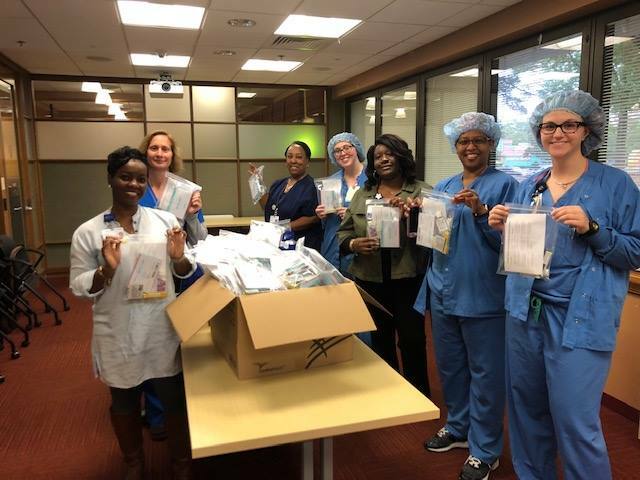 Flu kits are set out for patients to take at the end of their primary care visits during flu season. Each comes packed with Advil, cough drops, hand sanitizer, tissues, and a fact sheet. In just November alone, over 700 flu kits have been donated! Special thank you to Duke Raleigh Hospital, Highland United Methodist Church UMW and White Memorial Presbyterian Church. We are so grateful for the community’s partnership in serving the working, uninsured population in Wake County! Interested in hosting a flu kit drive? Contact rwofford@alliancemedicalministry.org. Newer PostShare the Pie 2018: A Slice of Success!